Fans of this particular blog-o-sphere - and there are thousands - will know I spend quite some time bashing the tragegy model as often as I am able to. Someone has to do it. ANd here's another opportunity. 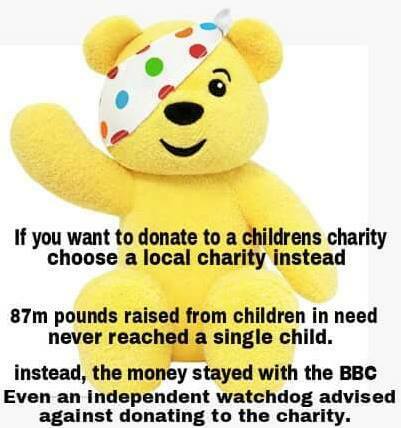 I never watch children in need. I prefer to attend Burn Pudsey Friday. But there's no avoiding this really is there. A creature of habit my tele viewing usually goes from the news to the local news to the awful one show and the one show represents one of the pudsey peddlars. I was in the kitchen, washing up and a scream came from the front room. My partner had spotted puds and was going "oh no oh no". A mother came on to tell us about her daughter. And her tale went something like this; she kept on rolling over so i knew something was wrong and took her to the hospital where she was diagnosed as having cerebral palsy. Well, it was devastating. All those dreams you have for your first born well they just go out of the window. Anyway, she wanted to be a ballet dancer. Really, no way, was she going to be a ballet dancer and life was just, well you know.... disappointing for her. But not to worry there was this wonderful dance group probably sponsored by Pudsey where she can now go and waggle her arms and legs around. Now, here comes my lesson learned. I'd have really have thought that by now Pudsey would have got over these negative portrayals of disabled people. But he hasn't and he isn't going to. Doom! Doom! Doom! Devastation! and Dashed Dreams! No wonder my partner screamed. And here's another one. The one show special.Get a group of kids who are having a bad time or who have survived a bad time and who proably did need support in education in health or in something else we should be seeing as a right andf get them all to line ujp and say thank you very much t hus demonstrating that the tragedy model demands smiles and gratitude. Its live, Its living. Its out there. And Matt Baker shags its silly. Anyway, we know better. This friday its Burn Pudsey Friday and here's a picture Chris Hughes put up on facebook. I have a feeling its old news.